Like deserts after rain, arctic and alpine habitats are also noted for their remarkable floral displays. The diminutive nature of plant vegetative organs in these marginal areas is not accompanied by a proportional reduction in the size of the flowers. Consequently, summer flowering displays are highly visible. Despite the abundance of flowers that is often found in montane and arctic habitats, it is necessary to determine the effectiveness of sexual reproduction, first in producing viable seed and secondly in establishing viable populations, under the potentially inhibiting combination of cold and short growing seasons that are found at high latitudes and altitudes. In a detailed study in Greenland of flowering success, as estimated through seedling production in Dryas integrifolia, Silene acaulis (Fig. 4.22) and Ranunculus nivalis, it was found that, despite prolific flowering in all three species, the production of mature seeds was very uncertain due to the unpredictability and quality of the growing season. Few seedlings survived and the population structure of the established species indicated that the input of new individual plants was episodic (Philipp et al., 1990). Fig. 4.22 Cushion pink (Silene acaulis). 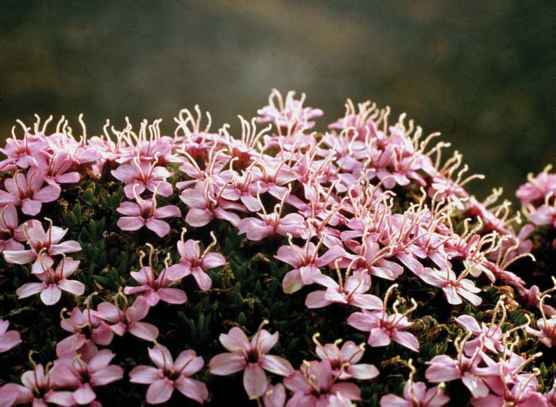 The species is predominantly gynodioecious (hermaphrodite and female flowers on separate plants). This cushion is a female plant and the species is an example of the early flowering pollen risking phenological strategy. In some sites only females and hermaphrodites can be found while in others female, male and hermaphrodite individuals have been recorded (see Alatalo & Totland, 1997). days after the plants have become free of snow and ice is a result of two partially related adaptations. The most immediately observable aspect is the short pre-flowering period at the beginning of the growing season which takes place in the long days of midsummer at high latitudes. However, this ability to produce flowers quickly is dependent on a second adaptation, namely the possession of preformed flowering buds. When the flowering requirements of ice grass (Phippsia algida), a high-arctic and high-alpine snow-bed grass species, were studied in controlled environments (Heide, 1992) seedlings flowered rapidly in continuous long days at temperatures ranging from 9 to 21 °C, provided they had previously had a short-day period for the initiation of flower primordia at the same temperatures. This snow-bed grass species thus has the characteristics of a regular long-day plant for the actual act of flowering but the initiation of flowering requires short days. This dual response to day length is found in other species similarly adapted to short growing seasons that occur in the vicinity of snow banks. The control of flowering of Carex bigelowii from the Rondane Mountains in southern Norway has also been shown to require short days and moderate temperatures for at least 10 weeks followed by long days for optimum flowering (Heide, 1992). Similarly, a number of arctic-alpine Carex species (Carex nigra, C. brunnescens, C. atrata, C. norvegica and C. serotina) all had a dual induction requirement for flowering (Heide, 1997). In other cases a more extreme situation exists where the initiation and development ofplant organs in cold, short growing season habitats often takes several years in order to bring both leaves and flower buds to maturation. A study of Polygonum vivipara (Diggle, 1997) has shown that four years are required for each leaf and inflorescence to progress from initiation to functional and structural maturity. Due to the protracted duration of leaf and inflorescence development, five cohorts of primordia, initiated in successive years, are borne simultaneously by an individual plant, which can limit the number of flowers and asexual bulbils that are produced in any one year. The short growing and unpredictable seasons that are characteristic of most arctic and alpine habitats carry specific risks in terms of the timing of sexual reproduction. Several studies of flowering in these cold habitats have sought to define strategies in relation to the advantages and risks involved with varying phenological patterns. Fig. 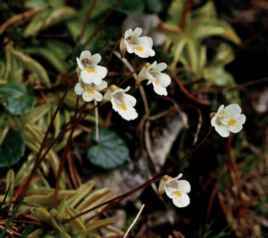 4.23 The alpine butterwort (Pinguicula alpina), an early flowering outbreeding species of this insectivorous genus. cannot be simply explained by the classical survival strategy concepts such as r and K selection. 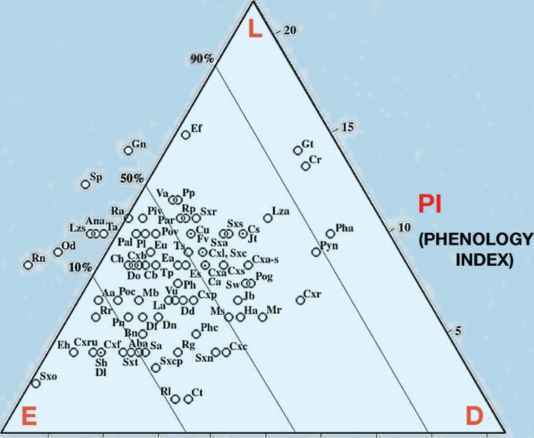 Instead, he hypothesized that arctic and alpine flowering plants are more realistically divided into two opposing categories, namely pollen-riskers and seed-riskers. The pollen-riskers are the early flowering plants which are outbreeding but show high rates of ovule abortion due to pollination failure (Fig. 4.24). Nevertheless, some seed is produced every year and as it is cross-pollinated will also provide some genetic dispersion. The late-flowering species are at the other extreme. The flowers are largely self-pollinating and there is little or no ovule abortion. However, in unfavourable years these late flowering species risk losing their entire seed crop (Molau et al., 2005). 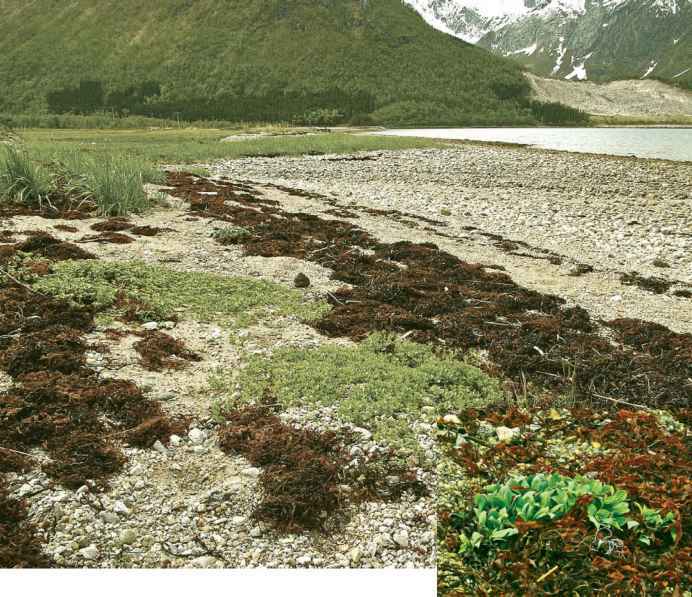 Which plants are in the arctic that are organisms?